Xeerpa has recently organized an event with Cool Tabs, Genetsis and representatives of companies from different industries, at The Valley Digital Business School. We discussed the challenges and the opportunities that Marketing teams face after the new General Data Protection Regulation took into effect. Alfredo Solano, CEO of Cool Tabs, explained how the process of data capturing should be adjusted to the new legal frame, the key element in clients and online users’ data management. The GDPR regulation offers users a better control enabling them to access, modify or delete their data, which, at the same time, means a major compliance effort for companies. Andrés Mercader, Partner at Xeerpa, emphasised the value of Social Media Profiling, a marketing tool totally compliant with GDPR, that includes explicit opt-ins and enables user to be fully conscientious about the data they share. The use of Social Login brings a double benefit: from the users’ perspective, it provides simplicity inthe registration process, not having to remember yet another password and should be followed by receiving much more relevant content; for the brand, a deeper customer knowledge, providing a better segmentation capacity. 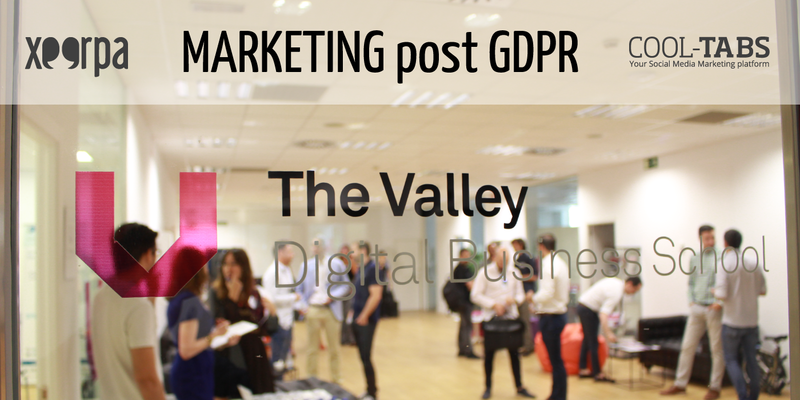 What are the main challenges and opportunities of marketing post GDPR? The participants concurred on the importance of adapting to the disappearing boundaries between online and offline strategies. According to Arancha Gómez, Digital Marketing Expert and Lecturer at ESIC and Universidad de Nebrija, “The new law hasn’t taken us by surprise, we’ve already been preparing for it since 2 or 3 years ago.” She also pointed out the benefits of the new rules in the light of the changing customer journey. Patricia Villarruel, Content Manager at the Ecuadorian Banco Pichincha, mentioned that GDPR only affects its clients who reside in Spain. However, the best practices of communicating with clients are being exported to Ecuador. These include strategies of client intelligence through microsegmentation campaigns centered on customer experience, touchpoints transformation and storytelling. How did you adjust your data capturing campaigns? “One of the strategies worth of mentioning is the integration of online and offline actions”, said Miguel Ángel Domínguez, CRM & Ecommerce Expert at Pernord Ricard. For that purpose, the liquor company moved their marketing campaigns strategy forward by creating a deep segmentation of preferences and using precise calls to action. For example, a draw among the participants of a specific offline event who posted a photo on Instagram. Arancha Gómez added that lead generation campaigns in marketing post GDPR is a perfect opportunity to clean the database and leave only the relevant contacts. Could you give us a couple of tips to prepare the legal base of promotion campaign? The participants agreed that absolute transparency about the data processing is crucial. Arancha Gómez commented on the importance of building multidisciplinary teams to have a global vision and align the departments. José Díaz, Head of X-CRM & Social Loyalty at Neo@Ogilvy, added that companies should raise awareness on RGDP and explain its impact on the way campaigns should be managed from A to Z. How does the data obtained via Social Network Profiling help approach new clients and win their confidence? According to all participants, the ability to personalize campaigns is a huge benefit that improves performance. Patricia Villarruel said that social data helped them approach the bank’s younger audience and that their clients were positively surprised with the new promos based on their likes and consumer preferences. Miguel Ángel Domínguez admitted that, thanks to Social Media Profiling, Pernod Ricard has achieved a more agile client experience, in addition to better understanding their clients. Lastly, José Díez added that Social Network Profiling technology offers a 360º vision of a client, analysing data and building a profile in a matter of seconds. As companies leaders in data-based marketing, what advise would you offer to brands that are initiating their data transformation? José Díez stressed that the key point is data treatment and utilisation, and it’s essential to prioritize quality and the results over quantity. Miguel Ángel Domínguez emphasised the importance of normalization and standardization of processes. Arancha Gómez reiterated the three cornerstones of the data-based strategy: intelligence, segmentation and personalization. In conclusion, the event provided us with a detailed vision of how to adjust our marketing campaigns to the requirements of GDPR that appears to be an opportunity to capture valuable leads, while segmentation and personalization are keys to excellent performance.